With IPL 11 nearing its business end, this is a do-or-die clash for both the teams. 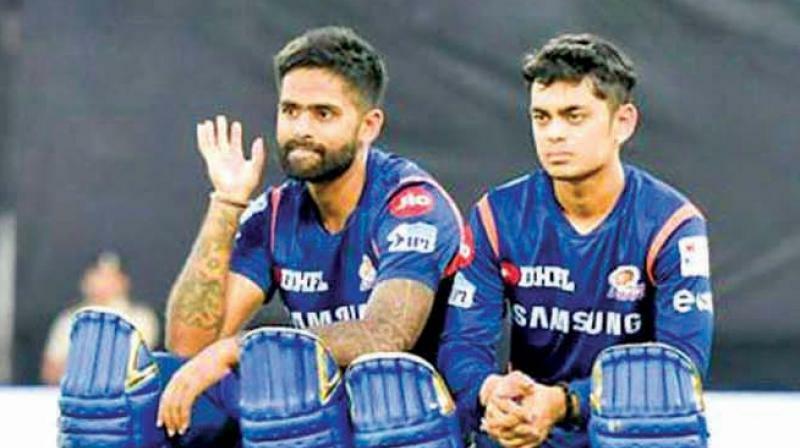 Suryakumar Yadav and Ishan Kishan. Mumbai: Mumbai Indians don’t need any introduction to miracles. They have faced the sternest of tests in the past and responded with aplomb. They have been kicked to the dirt and lifted themselves up strongly; started their campaign in a sluggish way and have still managed to sneak a qualification spot, somehow, proving their pedigree as the comeback kings. Come Sunday, a bigger test awaits them as they take on Rajasthan Royals who are brimming with confidence. With IPL 11 nearing its business end, this is a do-or-die clash for both the teams. With five wins and six defeats so far, both sides have 10 points in the kitty. Things have been clicking for the hosts, both in the batting and bowling departments, and it couldn’t be coming at a better time. Fortunes have been similar for Royals, who are coming off a morale-boosting victory over CSK. Both teams will be keen to avoid a slip up at this stage, particularly MI, who will be backing themselves to continue their dramatic run. “I guess we are not thinking about the playoffs yet because eventually we will be going match by match and that’s how we have played from the first game. Obviously, in the initial games, the results didn’t come our way, but it is not that we were playing bad cricket. Down the line and over a period of time, MI have played their best cricket when they are down and out. And I hope we continue that because now for remaining matches, every game is a do-or-die one,” said MI allrounder Krunal Pandya.